It is terrifying to imagine what it must have looked like that day in 1922 BCE when the Yellow River overtopped an earthquake-created dam and came roaring downstream. But the story of China's Great Flood is just one in a long tradition of similar tales throughout history, including the Biblical story of Noah and his ark. 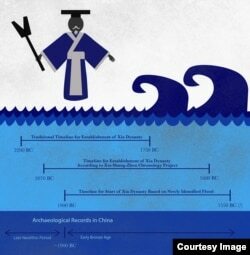 Now scientists say they have found proof that China's great flood actually happened. At that time, some 4,000 years ago, human civilization was beginning to blossom. The Earth's human population stood at about 27 million people, less than the 2014 population of Tokyo. In Africa, the Egyptians had built the great pyramids of Giza, and in Europe, the main circle at Stonehenge was nearing completion. In China, various societies were sprouting up along the banks of the Yellow (Huang He) River, at over 5,000 kilometers, the third longest in China, and known as 'the cradle of Chinese civilization'. But the Yellow River is an active and deadly waterway prone to flooding, and it has killed millions throughout history and as recently as the 1930s. The hero of China's Great Flood was the legendary ruler "Yu The Great," who worked tirelessly to control the waterway with the help of a Yellow Dragon and a Black Turtle. His successful efforts to tame the river led to his divine right to leadership, the first Chinese dynasty, the Xia, and the beginnings of Chinese civilization. Tales of Yu and the foundations of the Xia dynasty are told in the Bamboo Annals, dating from 296 BCE, and other ancient writings. But until archaeological remains coinciding with the Xia were found in the late 1900s, his story was often thought to be a myth. Archaeologists have also had trouble establishing a solid timeline for the founding of the Xia dynasty, which also marks China's transition from the Neolithic to the Bronze Age. 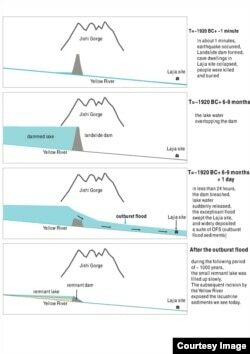 ​New research being published today in the journal Science offers a deeper look at how an earthquake and massive flood reshaped the region around the time of Yu and also places the establishment of the Xia dynasty much later than previously thought. Evidence of the flood was discovered by a group of researchers from China, Taiwan, and the United States, who looked at sediment deposits along the Yellow River Basin. Using radiocarbon dating, they determined that an incredibly powerful flood tore through the basin around 1920 BCE. Darryl Granger, from Purdue University, says by identifying "those sediments and carefully surveying their locations on both sides of the valley, we were able to find out... exactly how high the floodwaters reached." And what they discovered was a wall of water that Granger says would have been "38 meters high." But it wasn't rain that caused the flooding, Granger says. The scope of this flood was "500 times larger than a flood we might expect... from a massive rainfall event." So the team went farther upriver and found evidence of a giant earth and rockslide caused by an earthquake that dammed the Yellow River around the same time. They also found skeletons of children who were killed in the temblor. By carbon dating the bones, the team was able to place the date of the flood at exactly 1922 BCE. According to Granger, the Yellow River backed up behind the dam for "6 to 9 months until the lake reached the top of the dam," and broke through. David Cohen from the University of Taiwan says it has been hard for him to grasp the size and strength of the flood that followed. "This must be about one-third the height of the Empire State Building," he said. "I tried to imagine that amount of water just violently bursting forth out of this dam." To imagine the power of the flood, it helps to understand the extent of its impact, Cohen says. "Looking at models from known floods, we think that it could have easily reached 2000 or more kilometers downstream." The researchers say a flood of that strength and size would have been devastating, and its impact likely felt for decades. 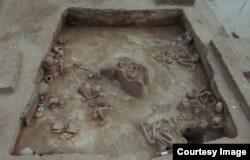 But from that devastation, scientists were surprised to find evidence that Chinese civilization not only bounced back, but advanced aggressively into the Bronze Age. This new research supports what the legends have told about the Xia dynasty and Chinese society. Archaeologists had already placed the beginnings of China's Bronze Age at around 1920 BCE because "bronze ritual vessels, and weapons" start showing up for the first time. Historically, Yu has received the lion's share of credit for controlling the Great Flood, Cohen says, "by dredging and guiding the waters back into their channels." The researchers haven't been able to find "any direct clues" as to how China's first great leader may have actually dredged the Yellow River, but Cohen says the technology was advanced enough that "by this time, people are already digging large amounts of earth and building huge rammed earth walls." The researchers also note that the size of settlements suddenly jumped in size. The average town, which had been about 30 hectares, soared to an average of 300 hectares, complete - Cohen says - with enough political control that large groups of people were working together to build "city walls which also had moats dug around them." It's an amazing collection of coinciding events that together form the basis for an understanding of almost exactly when Chinese Civilization got its start, and also gives us a better understanding of how natural events can influence the course of human civilization. The next phase of research, according to Cohen, is for archeologists working downstream to look for more evidence of this flood to determine just how far it traveled to impact the people living on the banks of the Yellow River.